Spring is here. That means Gundam Build Divers is finally airing! I reviewed the first episode for Anime News Network if you want to see what I thought. 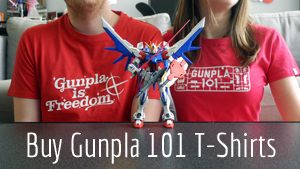 Generally, we’re thrilled to have another show about Gunpla fans for Gunpla fans. If you’re watching it and want to catch every obscure reference to every lesser-known mobile suit, check out our new column Deep Dive. After we got Blue Destiny Unit 1 and Unit 2, you knew this one was coming. In the manga this was the least celebrated of the three, made to provide spare parts for the other two! It’s also the one that differs the most; without the blue color scheme of the other two, it has a unique look. This is one massive mech, with a price tag to match. For $200, the Deep Striker is here to celebrate the 30th anniversary of Gundam Sentinel. Like the Neo Zeong, it’s not so much a mecha as it is a gigantic suit for an MG kit (the included S Gundam) to wear. Everyone’s favorite Hot Mom of the Gundam universe gets her own plastic model. Rinko is based on the Archangel from Mobile Suit Gundam SEED, which is a bit of a nod to the fact that she and Archangel captain Murrue Ramius share the same voice actress. HGBD stands for “High Grade Build Divers,” so expect to see a lot of this sub-grade moving forward. The Magnum is based on Gundam AGE’s Age-2 Normal and is first seen in the prologue. I’m certain we’ll see its pilot, Kyoya Kujo, again soon! I’m always excited when Hajime Katoki re-designs a Gundam model into his own Version Ka understanding. This version replicates how the Banshee looked in the novel long before it became the animated version of the Banshee that we know from the Gundam Unicorn OVA. Please let me know about any misprints in the comments!